Armament one single 3"/23 gun mount. Propulsion one 735 shp Fairbanks Morse diesel engine. one shaft. 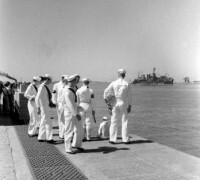 The first Flicker (AM-70) was built in 1937 by Bath Iron Works, Bath, Maine, as Delaware; acquired by the Navy 9 August 1940; and commissioned 26 October 1940, Lieutenant H. K. Hall in command. She was reclassified IX-165 on 11 April 1944. 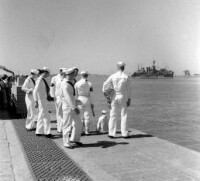 After training off Norfolk, Flicker carried out sweeping operations off Bermuda from May 1941 through December, then returned to Norfolk for minesweeping in the Virginia Capes. On 19 September 1942, she arrived at Recife, Brazil, where she served as harbor entrance guard ship and swept mines until 7 January 1943. Her base from that time to 11 July was Bahia, Brazil, and after operations at Rio de Janeiro, she returned to Bahia 21 November, to serve there until 8 February 1944.